New LPL Market Signals Podcast. On our latest podcast, due out this afternoon, listen to Senior Market Strategist Ryan Detrick and Equity Strategist & Portfolio Manager Jeffrey Buchbinder discuss the S&P 500 Index’s five-month win streak, recent economic reports, and emerging markets’ currency jitters. Please join our discussion on social via #LPLMarketSignals. Taking a breather. The S&P 500 declined all four trading days last week, the first time the gauge has dropped every day of a calendar week since November 2016. A selloff in technology stocks overwhelmed optimism from better-than-expected manufacturing, services, and nonfarm payrolls data. The 10-year Treasury yield climbed the most since May, putting additional pressure on stocks, after data showed average hourly earnings posted their fastest annual increase of the economic cycle last month, stoking concerns that inflationary pressures in the U.S. economy may be accelerating. U.S.-China trade spat escalates further. Markets around the world are still on edge, awaiting developments in an escalating trade spat between the U.S. and China. Chinese stocks dropped near a 2.5-year low today after President Trump threatened an additional $267 billion in tariffs on Chinese imports late last week. Investors are also anticipating a $200 billion round of levies on China (announced last month) to be implemented in the coming days. If all of these tariffs are put in place, the amount of taxed imports would exceed the $506 billion in Chinese imports the U.S. received last year. The week ahead. 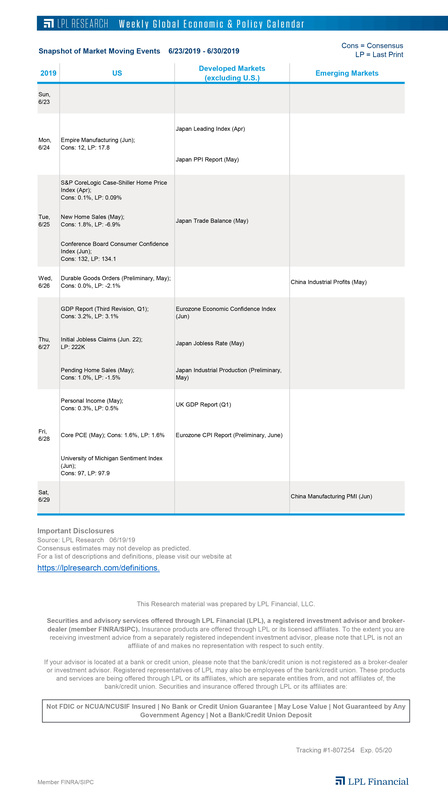 Investors have a decent slate of economic reports to watch this week. Inventories data and the JOLTS jobs report will be released tomorrow, while retail sales and industrial production reports are due out Friday. The Producer Price Index and Consumer Price Index reports, slated for Wednesday and Thursday, respectively, will provide important context on the state of inflation, especially after the pickup in wage growth in August. The Federal Reserve (Fed) will also release its latest version of its Beige Book, which highlights anecdotal evidence on economic conditions across the Fed’s 12 regions. The European Central Bank will also announce a rate decision Thursday at the conclusion of its September monetary policy meeting. EM enters a bear market. Last week, emerging market (EM) stocks officially entered a bear market, posting a 20% decline from their late-January peak. In our Weekly Market Commentary due out today, we discuss why large intra-year corrections are quite normal for EM. We also highlight negative sentiment toward EM, which we think could be a contrarian signal. We still believe the overall fundamentals in emerging markets remain strong, and we do not anticipate issues in countries like Turkey and Argentina to spread to others areas of EM. ISM’s cycle peak. Last week, data showed the Institute for Supply Management’s (ISM) U.S. Purchasing Managers’ Index (PMI) survey reached its highest point in 14 years last month, fueled by domestic demand as new orders surged. The strong ISM PMI reading is a sign to us that the current cycle still has legs: over its past five cycles, the U.S. economy has fallen into a recession an average of 46 months after the ISM index peaked. In our Weekly Economic Commentary due out today, we break down the current state of U.S. manufacturing and analyze the industry’s growth potential going forward.